Try searching above and if you can't find what you need, you can always ask! What is the Zapier Development Platform? Why Build a Zapier Integration? What Apps May Partner With Zapier? Can I Build a Private Integration? When you want to to automate your work, Zapier is the tool over 3 million people turn to. Zapier is an app automation platform that connects over 1,300 app APIs into customized, multistep workflows—what we call Zaps. Zaps start with a Trigger, which watches for new or updated data from an app. Zapier then uses that data to run Searches that find existing data in apps, and Create Actions to add new items or update existing items in apps. Zapier also includes built-in tools such as Schedule to run routine tasks, Formatter to manipulate data, and Paths to run different workflows based on filters and data from previous Zap steps. Zaps can be as simple or detailed as needed for a task. Most people start with Zap Templates, pre-built Zaps that make it easy to automate popular use cases such as adding new contacts to your address book or saving new customers to a CRM. Or, users can build custom Zaps with two or more steps to accomplish any workflow, mapping data from previous steps to create what they need. Zaps only run when data is added to or updated in an app account. Zaps do not import existing data, nor do they sync similar data between apps. Instead, they automate workflows around data to free you up to focus on your more important tasks. Your app's API could instantly connect to hundreds of other popular apps with a single Zapier integration. It's the easiest way to fulfill your customers' top feature requests while keeping your app focused on what it does best. The Zapier Developer Platform is a self-serve way for SaaS companies to integrate their app with Zapier. You can build a basic integration in minutes if you're a developer or familiar with APIs, and should be able to build a complete integration ready for Zapier's activation process within a week. Zapier Developer Platform includes two ways to build your integration. 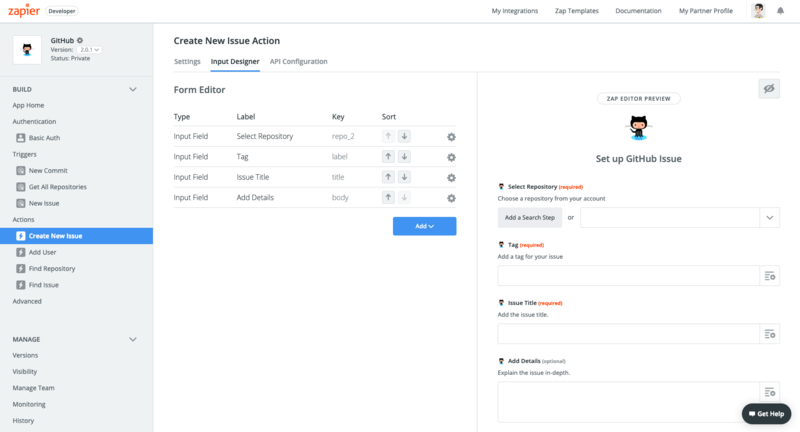 The easiest is with Zapier's Platform UI, an online visual builder to add app info, set authentication details, and triggers, searches, and create actions with input forms. It requires little developer knowledge, though does let you add custom code if needed. A Zapier integration is the easiest way to say "Yes!" when customers ask for integrations, something that may help reduce your app's churn rate. Build and maintain a single Zapier integration to connect your app with over 1,300 of the most popular business apps, with every other new app that integrates with Zapier automatically connecting to your app, too. Zapier insulates you from ongoing API maintenance, migration, and monitoring. Instead of maintaining and supporting dozens of different integrations, you only have a single Zapier integration to maintain and support. It's free to build a Zapier integration. All it requires is the time to build a single integration. With that, your app will be included in Zapier's app directory, the first place Zapier's over 2 million users look for new apps. Zapier also offers a wide range of co-marketing opportunities through our blog and email newsletter. To be a Zapier partner and publicly launch a Zapier integration, Zapier requires you be directly affiliated with the app and API integrated. If you are part of that app's team or have been contracted by that app to build a Zapier integration, then you may build a Zapier integration with the Zapier platform. Support your app integration, with both a commitment to assist your users and a responsive contact for any issues surfaced by Zapier support. Yes. If you are not directly affiliated with the app or API you want to integrate with Zapier, you may still use the Zapier development platform to build an integration for your private use. You can also build integrations for internal, non-public apps and share them privately with your company or team if you want. Those integrations are not eligible to launch as a public Zapier integration, but may still be used in live Zaps on your and any collaborators or testers' Zapier accounts. Ready to build a new Zapier integration? Learn the basics of the Zapier Developer Platform with tutorials that help you build an example integration in minutes. Start with the Visual Builder quick start guide to build an integration online, or our CLI quick start tutorial to start in your dev environment. Build a new integration in Platform UI at zapier.com/app/developer or follow the CLI Guide to install Zapier CLI. Find answers with Zapier's Platform UI documentation and CLI documentation to help build your integration. Have questions? Contact us for assistance in building a Zapier integration. Or, you can contract a Zapier Trusted App Developer to help build your integration.